We raise a joyful song to the Lord! In 2017, Presbyterian World Service & Development was once again blessed by the faithfulness and generosity of our supporters. 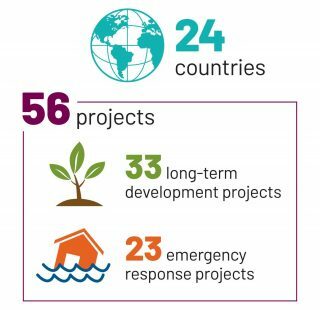 In the past year, PWS&D had many opportunities to both celebrate and lament as we responded with countless others in our global community to address poverty and hunger, as well as urgent humanitarian needs. As we respond to the suffering of others, we help grow hope, justice and opportunity. Women, men and children shaken by conflict received the shelter, food and comfort they needed. Farmers in Guatemala, Pakistan and Malawi learned innovative farming practices to help cope with a changing climate and rise above hunger. Mothers and babies in Afghanistan and Malawi are surviving childbirth and thriving with the care of skilled health workers. These are just a few of the examples of what your faithful prayers and financial support make possible. Together we have enabled life-changing development and relief work around the world, ensuring that women, men and children are able to achieve brighter, more sustainable futures. In the report you will also find information on how your financial resources were used and stories from people whose lives have been impacted. You can also place an order using our online order form. Detailed supporting schedules are available upon request at pwsd [at] presbyterian [dot] ca or 1-800-619-7301 x291.